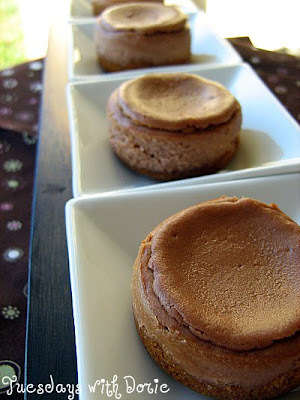 This week's pick for Tuesdays with Dorie is Low and Luscious Chocolate Cheesecake. It was chosen by Margaret, who is one of my Twitter buddies and you will be able to find the recipe on her blog, Tea and Scones, tomorrow. Since it is the Christmas holiday, we were given a little leeway about posting this recipe; we were given the opportunity to post it anytime between last Tuesday and tomorrow. We got back from DisneyWorld Saturday night. We had a blast! So much fun. We were really worn out though. In a couple of hours, my husband and I are flying to DC for a quick 24 hour trip because one of my good friends is getting married up there. Luckily, my older sister lives in DC, so we have someone to pick us up and someone to stay with. I am super excited because I get to see my new nephew that was born in September. Anyway, I am trying to unpack and then pack again, do laundry and everything else, so I am posting this right now, while I have a few moments. I also think a chocolate crust would be great on this cheesecake. Go check out the TWD Blogroll to see everyone else's cheesecake and have a great day! This year I decided to celebrate my birthday on my blog with a savory, healthy recipe. Plus, since my birthday is the day before Christmas, I thought this red and green soup was the perfect thing to post! Yesterday was my hubby's b-day and today is mine, so we get 2 days of free admittance to DisneyWorld. I made this soup when my sister was here for Thanksgiving Break because my hubby hates tomatoes and I knew if she was here with me, I would have at least one other person that would eat it and love it. 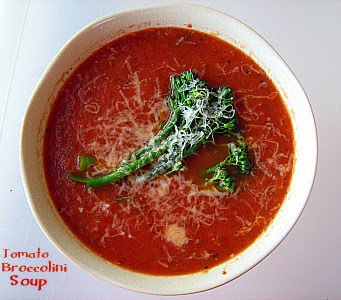 The soup is a basic tomato soup without any cream or anything, so it is really healthy. I added more stock, to get it to the right consistency of soup-i-ness for us. I actually had 2 kids who really liked this one and I loved it! 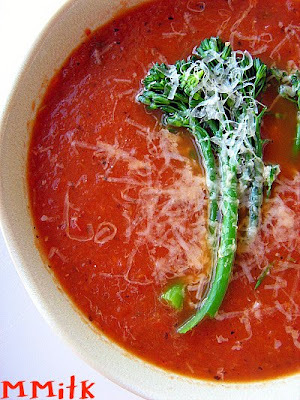 The broccolini in the soup added a really great flavor. I made extra broccolini so that even those people who think tomatoes are poisonous, could enjoy the yummy green stalks. So give it a try, if you aren't scared of tomatoes. It makes great leftovers too. I am going to go get on a roller coaster to celebrate my birthday! So, in a couple of hours we leave for Disneyworld. We are driving through the night and we will go to the Magic Kingdom in the morning. This is the first time I have ever been there, as well as the first time my kids have ever been there. We are going with our good friends who have children the exact same ages as our kids. We will be spending Christmas down there. I wanted to leave you with a yummy treat. I saw these festive Peppermint Patties on Aggie's blog a week or so ago. Aggie is one of 5 bloggers who participates in the Cooking Light Virtual Supper Club, and this month their theme was a Cookie Exchange. 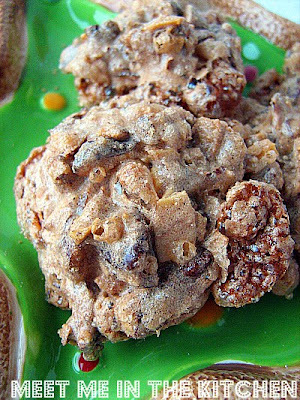 I know that I have seen these cookies in a Cooking Light cookbook a couple of times, but when I saw them on Aggie's blog, I realized that I had to make them. Her pictures were absolutely scrumptious and around the holidays, you can always use a lighter treat. I have also been wanting to make Peppermint Ice Cream, but kept on telling myself it was not necessary. 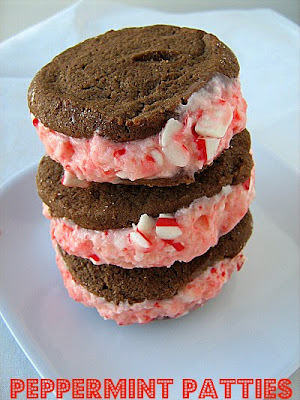 I happened to find a recipe for Peppermint Ice Cream from Cooking Light and decided to combine the two recipes. 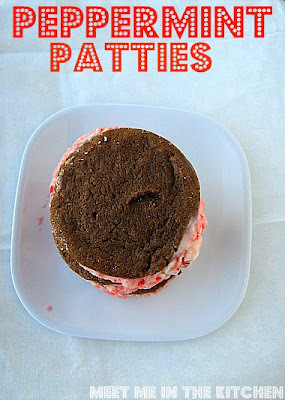 Originally these ice cream sandwiches are supposed to be filled with vanilla ice cream and then rolled in crushed peppermint candy, but I decided to make and use the Peppermint Ice Cream. I also decided that I would try and take pictures before the sandwiches set up in the freezer. Bad idea! Talk about a melty mess. So, then I let the ice cream set in the freezer for a couple hours and followed the instructions, which said to wrap the sandwiches once you fill them with ice cream and roll them in candy, in plastic wrap and let them set up in the freezer for 4 hours before serving. Genius! Who would have thought that actually following the instructions would make a difference? Just kidding on that one. The ice cream was a little bit overly sweet for me on its own, but with the cookies it tasted just right. I added 1/2 tsp peppermint extract to the ice cream, to up the peppermint flavor. My kids also sneaked a couple of cookies plain and thought they were delicious. 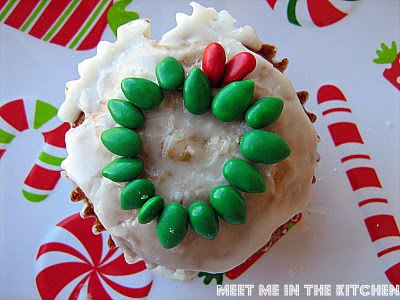 This is a fun, festive holiday treat, that can be made in advance and the results are yummy! Just make sure to give yourself enough time to let the sandwiches set up properly. Every time I open a can of pumpkin, I know exactly what I am going to do with it. Well, at least part of it. The fun thing is figuring out what to do with the sometimes 1/3 cup or so, of pumpkin puree that I have leftover. from Pinch my Salt. 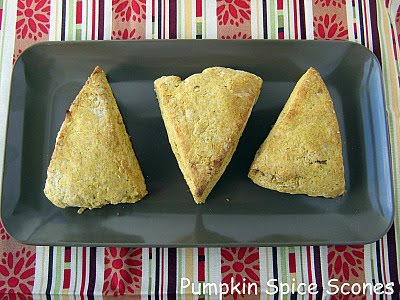 But I read that the recipe had been triple tested until it was just right and I loved the spices that were included in these scones. Also the two different icings, cinnamon and ginger-molasses had me intrigued. These scones were absolutely amazing. I don't know if it was the fact that these had cake flour in them, but they were so soft and delicious. I can't even explain the texture, it was unbelievable. Cathy and I were tweeting about these and we completely agreed, so its not just me that raved about these. The spices were absolutely perfect too. I left out the raisins, just because I felt like it. I love raisins, but I really didn't want them in these for some reason. I can't wait to make these again over the Christmas break. Perfect for breakfast, brunch or a snack. I will use any excuse to make these again. I made a little bit of a change on the icing-- I poured a little bit of molasses in a bowl- added some ground ginger and about 1 cup of powdered sugar. added skim milk until I could get it to come together. More ginger and molasses, until it had that spicy bite. I have been looking at the older holiday magazines that I have kept and this salad jumped out at me. I think it must have been the combination of colors and the variety of vegetables that caught my eye. I decided to make this when my sister was visiting over the Thanksgiving break and I cut the recipe in 1/2. I think it would be delicious served on top of romaine or mixed greens, but it is very delicious on its own. It can also be made ahead, which is great if you are having a really hectic holiday season. It is just nice to see some pretty veggies that make you want to taste them. Everyone needs a little distraction from the sweets right about now. Or maybe it is just me! 1. 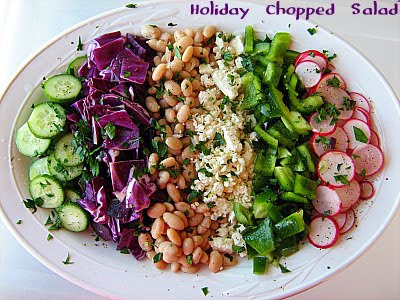 In separate resealable plastic bags, place beans, green pepper chunks, cucumber chunks, radicchio, and radishes. For dressing, in a screw-top jar, combine oil and lemon juice. Cover and shake well. Add honey, salt, and black pepper, covering and shaking well, after each addition. Pour 1 to 2 Tablespoons dressing into each bag. Seal bags. Chill for 2 to 4 hours, turning bags occasionally. 2. To serve- arrange vegetables with dressing and feta cheese in rows on serving platter. Sprinkle with parsley and/or mint. 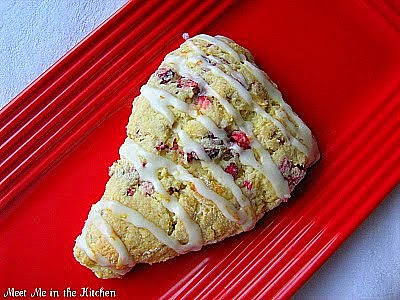 A couple of weeks ago, Bridget of The Way the Cookie Crumbles, posted a bunch of scone recipes, one after the other. 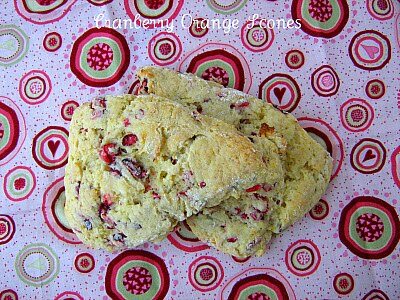 I had been looking for another way to use my fresh cranberries and had seen lots of scones with dried cranberries, but fresh are so much better! I made some scones with fresh cranberries last year, which were really good, but I always like trying new recipes and I loved that this recipe had 1 1/2 cups of fresh cranberries. 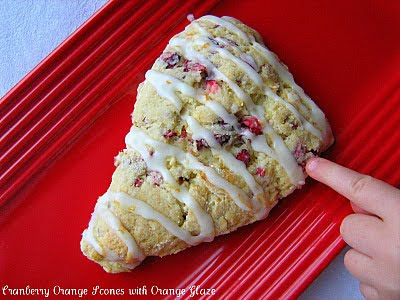 Bridget noted that the original recipe calls for lemon zest to be used in these scones, but she used orange instead and I wanted to use orange too, because cranberry and orange is a classic combination in my mind. I was curious if I could make these work using low-fat buttermilk instead of heavy cream, just to make them a little bit on the healthier side. I did it and they worked. I reduced the amount by about 2 Tbls and the dough was still very soft, but it worked. I also made a quick glaze with powdered sugar, fresh orange juice and orange zest. My girls and my nephew each gobbled one down, which kind of surprised me since the cranberries are very tart. I froze a couple, which were already baked and shared them with my sister when she came to visit. 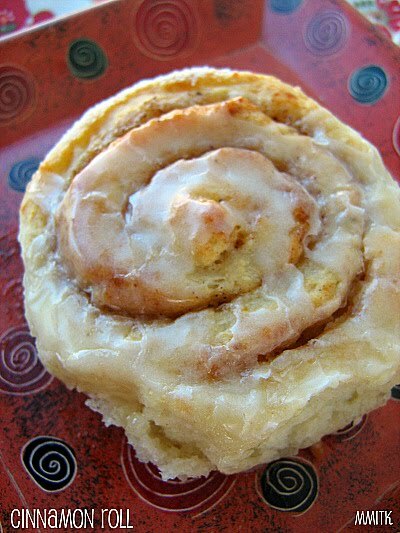 These would also make a great holiday breakfast or brunch item. Very seasonal and festive. And besides, cranberries have more antioxidants than almost any other fruit. That has to make you feel good about eating one of these scones. A couple of my blogging/twitter friends started Secret Baker. Basically, a bunch of us bake and then send treats to our "secret" person, once a month. This month I got these Cinnamon Bun Cookies. So, I didn't make them, but I took a picture of them because Margaret is going to post a round-up of all the goods that were received. 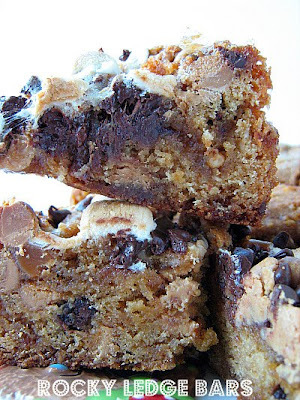 These were just so yummy, I thought I would give you the link, even though I didn't make them myself. 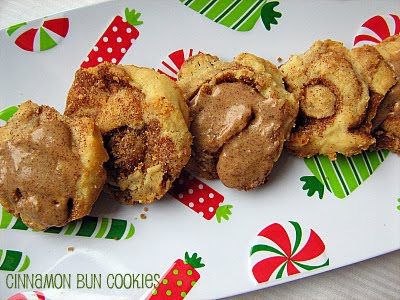 They would be a great addition to a holiday treat plate! Thanks to Whitney of Nosh and Tell who sent these to me! The post on Nosh and Tell about these cookies. This month's MSC Cupcake was chosen by Kayte who blogs over at Grandma's Kitchen Table. We don't post the recipes for this group, but you can read more about her pick by going to this post. You can find the recipe by turning to page 246 of Martha Stewart's Cupcakes. This cupcake definitely has the flavor of gingerbread, all the right spices. It is supposed to be topped with Fluffy Vanilla Frosting, but I made a lemon glaze instead. My mom used to make gingerbread this time of year when I was growing up and it always was served with a lemon sauce, so I tried to recreate that flavor combination. 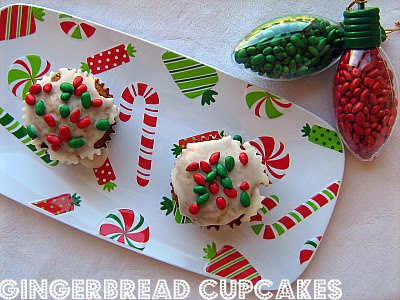 These cupcakes were also topped with optional Gingerbread Cutouts. I was a little cookie-d out when I made these last week, so I skipped those and used Chocolate Covered Candy Coated Sunflower Seeds to top my cupcakes instead. I found these cute little containers of the candy sunflower seeds that looked like Christmas lights at Cracker Barrel and decided they were a fun little prop. Plus, the candy sunflower seeds are really yummy. After I had just sprinkled them on, I realized I could have made little shapes or wreaths on my cupcakes or whatever I felt like, with the sunflower seeds. These cupcakes were the perfect pick for December. The perfect flavor and everything for this time of year! Go to the MSC Blogroll to see what everyone else thought about these cupcakes and to see some great decorating! 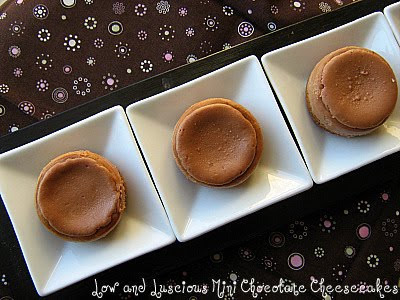 This week's Tuesday's with Dorie recipe is Cafe Volcano Cookies. These cookies were chosen by MacDuff and you can find the recipe by going to her blog, The Lonely Sidecar. What is a Cafe Volcano Cookie? Well, that is a really good question. I guess it is a nut mixture/meringue, although when I was making these I really believed they would not turn into anything edible. This is the easiest cookie ever. You toast some nuts. I used sliced almonds and chopped pecans. Once those are toasted you combine them in a saucepan with egg whites and sugar. And in my case cinnamon, because I don't drink or use coffee and so there is no espresso powder in my house and there never will be. You let the ingredients get warm and then you drop that syrupy/nutty/sugary mixture onto a baking sheet covered with parchment. At this point, I figured I had done something wrong because it looked like I was just dropping blobs of wet nuts on my baking sheet. Which is what I was doing. But, I had followed the recipe, so I popped them in the oven and waited for some miracle. They did puff a little and turned into a cookie shape, so I figured that must be what they were supposed to look like. I tried a piece of one and they tasted like spiced nuts. I sent these along with the other Christmas goodies I made in the mail to my family members in different states. One of my sisters said these were one of the best cookies of the bunch. Go check out the TWD Blogroll to see what other bakers thought of this weeks recipe! or maybe it should be called Butternut Squash Puree. I don't know exactly. Did you hear about the hugest butternut squash ever? Well, if you didn't, I will just tell you that this soup/puree is the last food item that I made with my gigantic squash. I cut my squash into cubes and roasted it in the oven with a chopped onion, fresh chopped thyme, rosemary, and oregano. Of course, it was tossed with olive oil, salt and pepper. I roasted it for about 25-30 minutes at 425 degrees and when the squash was tender, I put the oven roasted mixture in the food processor. I added some chicken broth, just to thin it out a little bit and, there you go- soup or puree or whatever you want to call it. Healthier than some recipes because it doesn't contain any cream or half and half and so easy. So if you happen to have a butternut squash on your hands and have no idea what to do with it, roast it in the oven. There are so many possibilities once you have all those tender little cubes of roasted squash! I can't remember when I saw this recipe, but I actually made it months ago when I had some cottage cheese in the fridge to use and I somehow came upon this recipe that uses cottage cheese in the dough. I was on a kick of trying out different cinnamon roll/breakfast recipes and decided to give this recipe a try. 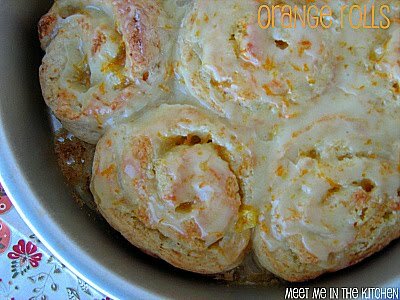 I wasn't sure how my family would like the orange filling and glaze, so I made half of the rolls with a cinnamon filling- the one from this recipe. 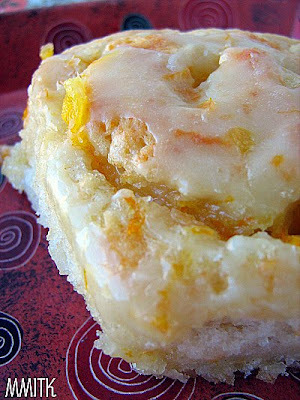 My daughter helped me put together the dough and different fillings and this recipe was super easy, which I absolutely love. The thing that is great about these rolls, is that they are ready in no time and they taste just as good as any breakfast roll that contains yeast. I was surprised at how well the orange rolls were received, especially by my hubby. He really liked them. 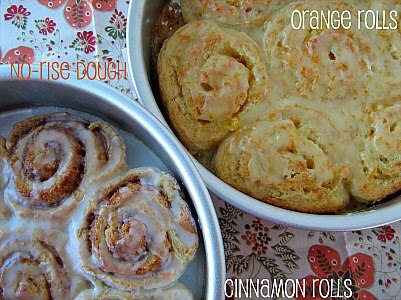 The only thing I changed was the glaze on the orange rolls. I just used a combination of powdered sugar and fresh orange juice. These would be a great thing to try at a holiday brunch or breakfast because they are ready in a flash. When my sister was here visiting a couple weeks ago, I asked her what cookies she wanted me to make and send her for Christmas. I gave her some Holiday Baking Magazines and told her to pick as many as she wanted. She folded down lots and lots of pages and then I narrowed it down to 6. I chose things that I could make all in the same day and then threw in a couple more treats at the end. 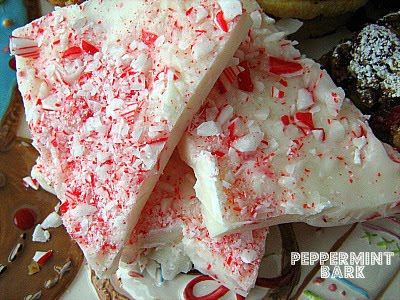 First up is Peppermint Bark. 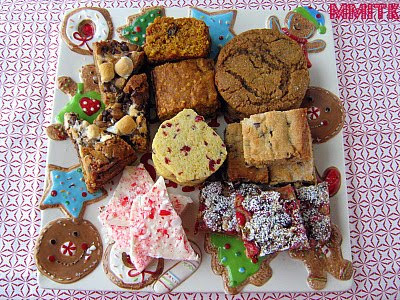 This is a Christmas goodie that my mom has made for quite a few years and she uses Martha Stewarts recipe. I actually like it better when you use almond bark instead of white chocolate, so that is what I did. I like to sprinkle some of the chopped candy canes on top, as well as mixing them into the melted white stuff. My hubby really likes this and so do my kids. Great gift. 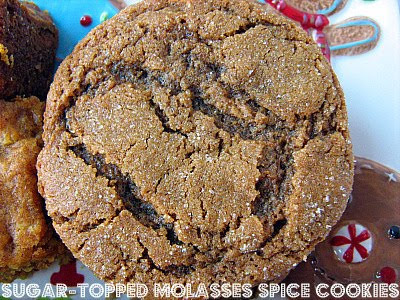 My sister requested a molasses cookie and I decided I would make Dorie's recipe, because I knew it was a crowd pleaser. This time I didn't flatten my balls of dough, so I had smaller, chewier cookies. This recipe is so great that it really deserves a repeat. I sent some of the last batch to my family, so they will be super excited to get more of them in the mail. 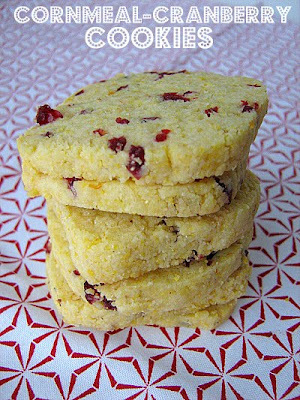 I saw this cookie in a Martha Stewart Holiday Cookie issue and was intrigued by the combination of cornmeal and dried fruit in a cookie. I knew sending this cookie to someone else would be great, since most members of my family do not like cornmeal. The recipe originally called for dried cherries, but I subbed in dried cranberries because that is what I had in the pantry. These also have orange zest and they aren't overly sweet. Great cookie. 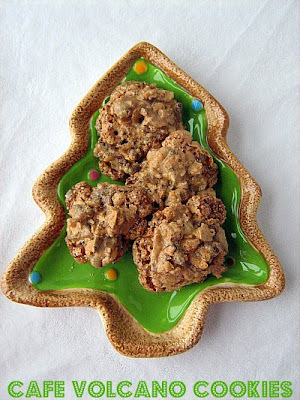 I saw this cookie in a couple of different Martha Stewart mags and remembered that Tracey made them a couple weeks ago. I figured bars are great for sending and these have all types of mix-ins, so they were added into the bunch. 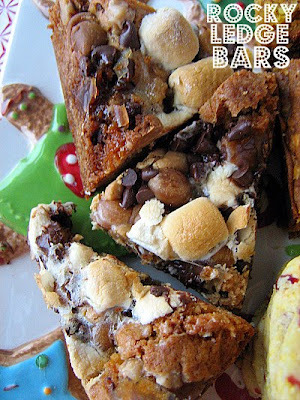 I subbed in peanut butter chips for the butterscotch chips, toffee bits for the white chocolate and then, on top of that, these have chocolate chips, cut up caramels, and marshmallows. What a combination. I think I will have to make these again. My son was upset that he didn't get to sample one. My sister wanted these peanut butter bars. They were supposed to have Hershey's Kisses on top, but I thought they would send better if they didn't have those on top. 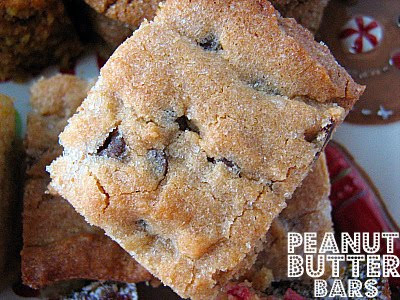 They are a play on Peanut Butter Kisses, but easier to make because they are a bar. 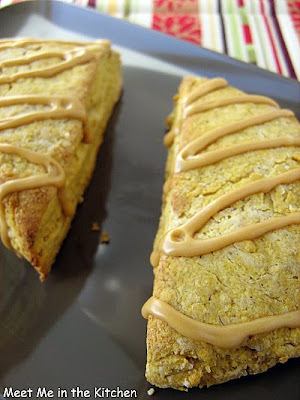 I used creamy peanut butter in these, instead of chunky. My sister chose these bars and I thought they were a great choice because they have green and red in them naturally. 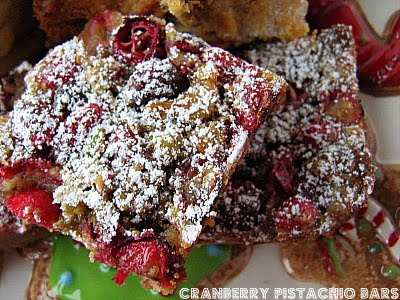 They have a basic butter, flour, brown sugar crust, which you prebake for a few minutes and then the cranberry-pistachio topping is added and they are put back in the oven to finish baking. 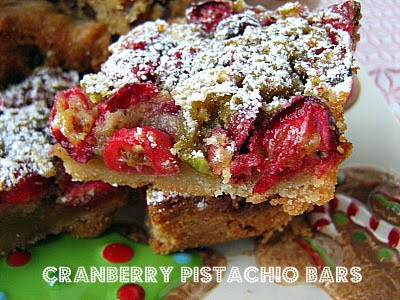 Great way to use fresh cranberries. My sister also chose these pumpkin oatmeal raisin cookies. 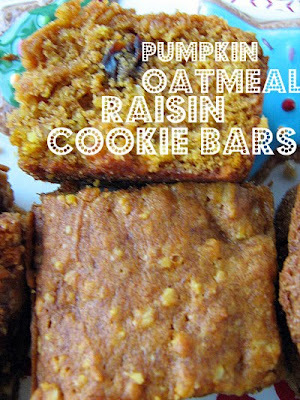 They are just like an oatmeal raisin cookie, but with pumpkin puree added to the batter. I made these into bars, simply because I was trying to bake 8 different things all in one day and it made it easier for me. I wasn't too excited about these, but I did taste a small square and they really were good. Definitely more tasty then they might seem. So, these are all the items that made it into my treat box. I sent a few of most of these cookies to my Secret Baker. I also made a batch of Spiced Pecans and the upcoming cookie for Tuesdays with Dorie got thrown into the mix too. Needless to say, after this day of baking, packaging and mailing, I was wiped out. It was worth it though. I also threw in a picture of the Cake Pops I made last weekend for a birthday party. 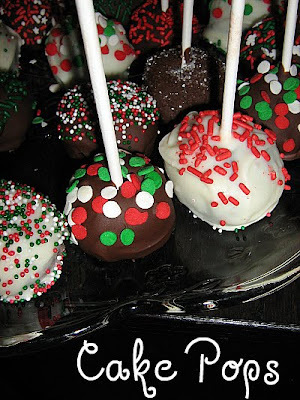 These are a fun little treat for a Christmas or Holiday get-together, if you need a fun idea. 1. Preheat the oven to 350 degrees. Lightly grease baking sheets. 2. Combine flour, oats, baking soda, cinnamon, and salt in a medium bowl. 3. Beat butter, brown sugar, and granulated sugar in a large mixer bowl until light and fluffy. Add pumpkin, egg, and vanilla; mix well. Add flour mixture; mix well. Stir in nuts and raisins. 4. Drop by rounded Tablespoonfuls onto prepared baking sheets. 5. Bake in preheated oven for 14 to 16 minutes or until cookies are lightly browned and set in centers. Cool on baking sheets for 2 minutes; remove to wire racks to cool completely. I did not make this recipe exactly. I did use some of the same ingredients and made something that my kids would eat. 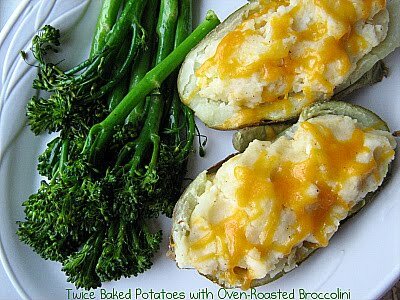 Somehow I got inspired by the potatos, the cheese and then switched out the broccoli for broccolini. It just tastes so much better. I baked my potatoes in the oven until I was able to scoop out the insides and then I just mashed the potatoes with 2 Tbls of unsalted butter, 1/3 cup fat free greek yogurt, 2 Tbls skim milk, salt and pepper. I drizzled my broccolini with olive oil, then added some salt and pepper, and roasted it in a 400 degree oven until it was tender, about 15 minutes. I put the mashed potato mixture back into the potato skins and then covered them with cheddar cheese. I popped them back in the oven, until the cheese was melted and the potatoes were warm throughout. So, not exactly what the recipe said to do, but sometimes you have to improvise! 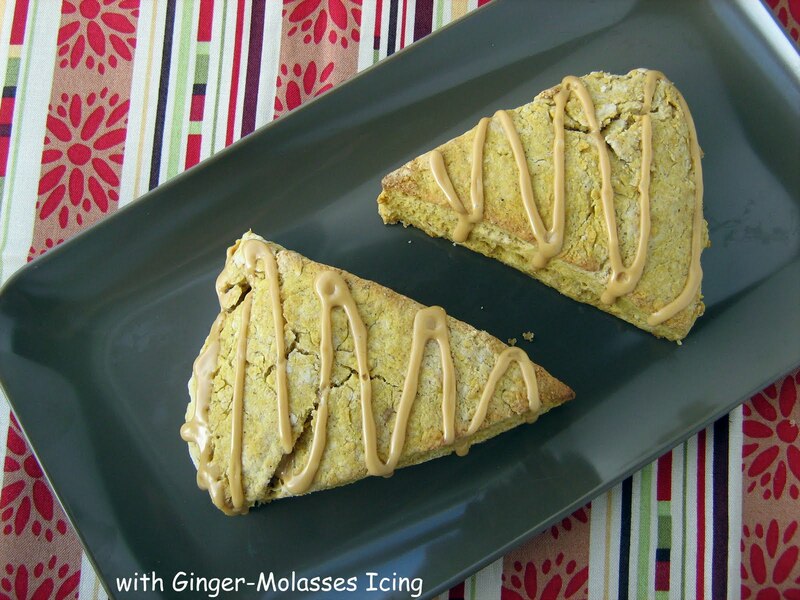 Check out the CEIMB Blogroll to see what everyone else did with this recipe!